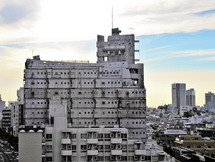 The renewal of Tsukiji district was planned by Kenzo Tange. The project is a great example of metabolist architecture. After we had made public our Tokyo Plan 1960, and just as I was hoping for an opportunity to design an office buildingwith a three-dimensional network based on the civic axis set forth for that plan, Mr. Hideo Yoshida, president of Dentsu, the largest advertising company in Japan, commissioned me to design headquarters offices for his firm... I felt that the site, located in the Tsukiji district of Tokyo, along Express Highway No. 1, had been selected with a view to future development. Convinced that Dentsu itself would develop too,, I gegan considering the optimum nature of an enterprise founded on informational services and the influence it would exert on the surroundings. The design I proposed consisted of widely spaced vertical cores connected by means of horizontal spaces free of posts. The design was based on the idea that extending the core system right and left and forward and rearward wit these horizontal spaces would enable the building to conform to all kinds of future development... Mr. Yoshida was so happy when he saw the proposal that he began talking of the likelihood of a similar kind of redevelopment for the entire Tsukiji district. What followed, however, was a quite unexpected reversion. Yoshida passed away when the construction was about to start, and the succeeding president of Dentsu, a pragmatic person, abandoned Tange's plan. He turned to a new scheme which, in Tange's point of view, was 'perfectly ordinary'. Tange was extremely disappointed by this change and regretted to see that, as Dentsu Corporation continued to grow in the following years, its buildings spread all over the neighborhood but failed ti form a coherent complex as he had expected. 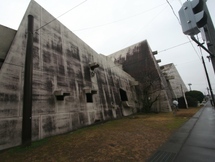 Although his Dentsu project was not realized, Tange gained confidence in the 'technical feasibility of the three-dimensional network', which he soonn applied in the design of the Yamanashi Broadcasting and Press Centre.